Surya Ganguli presented exciting new results improving from his last NIPS workshop and last COSYNE workshop talks. Our experimental limitations put us to analyze severely subsampled data, and we often find correlations and low-dimensional dynamics. Surya asks “How would dynamical portraits change if we record from more neurons?” This time he had detailed results for single-trial experiments. Using matrix perturbation, random matrix, and non-commutative probability theory, they show a sharp phase transition in recoverability of the manifold. Their model was linear Gaussian, namely , where X is a low-rank neural trajectories over time, U is a sparse subsampling matrix, and Z is additive Gaussian noise. The bound for recovery had a form of , where K is the dimension of the latent dynamics, P is the temporal duration (samples), M is the number of subsampled neurons, and SNR denotes the signal-to-noise ratio of a single neuron. Vladimir Itskov gave a talk about inferring structural properties of the network from the estimated covariance matrix (We originally invited his collaborator Eva Pastalkova, but she couldn’t make it due to a job interview). An undirected graph which has weights that corresponds to an embedding in an Euclidean space shows a characteristic Betti curve: curve of Betti numbers as a function of threshold for the graph’s weights which is varied to construct the topological objects. For certain random graphs, the characteristics are very different, hence they used it to quantify how ‘random’ or ‘low-dimensional’ the covariances they observed were. Unfortunately, these curves are very computationally expensive so only up to 3rd Betti number can be estimated, and the Betti curves are too noisy to be used for estimating dimensionality directly. But, they found that hippocampal data were far from ‘random’. A similar talk was given at CNS 2013. William Bishop, a 5th year graduate student working with Byron Yu and Rob Kass, talked about stitching partially overlapping covariance matrices, a problem first discussed in NIPS 2013 by Srini Turaga and coworkers: Can we estimate the full noise correlation matrix of a large population given smaller overlapping observations? He provided sufficient conditions for stitching, the most important of which is to make the covariance matrix of the overlap at least the rank of the entire covariance matrix. Furthermore, he analyzed theoretical bounds on perturbations which can be used for designing strategies for choosing the overlaps carefully. For details see the corresponding main conference paper, Deterministic Symmetric Positive Semidefinite Matrix Completion. Unfortunately, due to weather conditions Rob Kass couldn’t make it to the workshop. Memming: I presented the Pinocchio paradox, which is a fun variant of the Liar paradox. Pinocchio’s nose grows if and only if Pinocchio tells a false statement. What happens when Pinocchio says “My nose grows now”/”My nose will grow now”? It either grows or not grows. If it grows, he is telling the truth, so it should not grow. If it is false, then it should grow, but then it is true again. Our natural language allows self-referencing, but is it really logically possible? (In the incompleteness theorem, Gödel numbering allows self-referencing using arithmetic.) There are several possible resolutions, such as, Pinocchio cannot say that statement, Pinocchio’s world is inconsistent (and hence cannot have physical reality attached to it), Pinocchio cannot know the truth value, and so on. In any case, a good logical system shouldn’t be able to produce such paradoxes. Jonathan Pillow, continuing on the fairy tale theme, presented the sleeping beauty paradox. Toss a coin, sleeping beauty will be awakened once if it is head, twice if it is tail. Every time she is awakened, she is asked “What is your belief that the coin was heads?”, and given a drug that erases the memory of this awakening, and goes back to sleep. One argument (“halfer” position) says since a priori belief was 1/2, and each awakening does not provide more evidence, her belief does not change and would answer 1/2. The argument (“thirder” position) says that you are twice more likely to be awakened for the tail toss, hence the probability should be 1/3. If a certain reward was assigned to making a correct guess, the thirder position seems to be correct probability to use as the guess, but do we necessarily have matching belief? This paradox is still under debate, have not had a full resolution yet. Karin Knudson introduced the Banach-Tarski paradox where one solid unit sphere in 3D can be decomposed into 5 pieces, and only by translation and rotation, they are reconstructed into two solid unit spheres. In general, if two uncountable sets A, B are bounded with non-empty interior in with , then one can find a finite decomposition such that each piece in A is congruent to the corresponding piece in B. It requires some group theory, non-measurable sets, and the axiom of c hoice (fortunately). Harold Gutch told us about the Borel-Kolmogorov paradox. What is the conditional distribution on a great circle when points are uniformly distributed on the surface of a sphere? One argument says it should be uniform by symmetry. But, a simple sampling scheme in polar coordinate shows that it should be proportional to cosine of the angle. Basically, the lesson is, never take conditional probabilities on sets of measure zero (not to be confused with conditional densities). Furthermore, he told us about a formula to produce infinitely many paradoxes from Jaynes’ book (ch 15) based on ill-defined series convergences. I had a wonderful time, and I really appreciate my friends for joining me in this event! Recently, there was a press release and a youtube video from University of Florida about one of my recent papers on neural code in the lobster olfactory system, and also by others [e.g. 1, 2, 3, 4]. I decided to write a bit about it in my own perspective. In general, I am interested in understanding how neurons process and represent information in their output through which they communicate with other neurons and collectively compute. In this paper, we show how a subset of olfactory neurons can be used like a stop watch to measure temporal patterns of smell. Unlike vision and audition, the olfactory world is perceived through a filament of odor plume riding on top of complex and chaotic turbulence. Therefore, you are not going to be in constant contact with the odor (say the scent of freshly baked chocolate chip cookies) while you search for the source (cookies!). You might not even smell it at all for a long periods of time, even if the target is nearby depending on the air flow. Dogs are well known to be good at this task, and so are many animals. We study lobsters. Lobsters heavily rely on olfaction to track, avoid, and detect odor sources such as other lobsters, predators, and food, therefore, it is important for them to constantly analyze olfactory sensory information to put together an olfactory scene. In auditory system, the miniscule temporal differences in sound arriving to each of your ears is a critical cue for estimating the direction of the sound source. Similarly, one critical component for olfactory scene analysis is the temporal structure of the odor pattern. Therefore, we wanted to find out how neurons encode and process this information. The neurons we study are of a subtype of olfactory sensory neurons. Sensory neurons detect signals, encode them into a temporal pattern of activity, so that it can be processed by downstream neurons. Thus, it was very surprising when we (Dr. Yuriy Bobkov) found that those neurons were spontaneously generating signals–in the form of regular bursts of action potentials–even in the absence of odor stimuli [Bobkov & Ache 2007]. We were wondering why a sensory system would generate its own signal, because the downstream neurons would not know if the signal sent by these neurons are caused by external odor stimuli (smell), or are spontaneously generated. However, we realized that they can work like little clocks. When external odor molecules stimulate the neuron, it sends a signal in a time dependent manner. Each neuron is too noisy to be a precise clock, but there is a whole population of these neurons, such that together they can measure the temporal aspects critical for the olfactory scene analysis. The temporal aspects, combined with other cues such as local flow information and navigation history, in turn can be used to track targets and estimate distances to sources. Furthermore, this temporal memory was previously believed to be formed in the brain, but our results suggest a simple yet effective mechanism in the very front end, the sensors themselves. Applications: Currently electronic nose technology is mostly focused on discriminating ‘what’ the odor is. We bring to the table how animals might use the ‘when’ information to reconstruct the ‘where’ information, putting together an olfactory scene. Perhaps it could inspire novel search strategies for odor tracking robots. Another possibility is to build neuromorphic chips that emulate artificial neurons using the same principle to encode temporal patterns into instantaneously accessible information. This could be a part of low-power sensory processing unit in a robot. The principle we found are likely not limited to lobsters and could be shared by other animals and sensory modality. EDIT: There’s an article on the analytical scientist about this paper. Bobkov, Y. V. and Ache, B. W. (2007). Intrinsically bursting olfactory receptor neurons. J Neurophysiol, 97(2):1052-1057. This work by I. Memming Park is licensed under a Creative Commons Attribution 4.0 International License. Evan and I wrote a summary of the COSYNE 2014 workshop we organized! Let me explain one by one. First of all, if you have continuous (analogue) observation, read the title of this post. CDM, PYM, DPM, NSB are Bayesian estimators, meaning that they have explicit probabilistic assumptions. 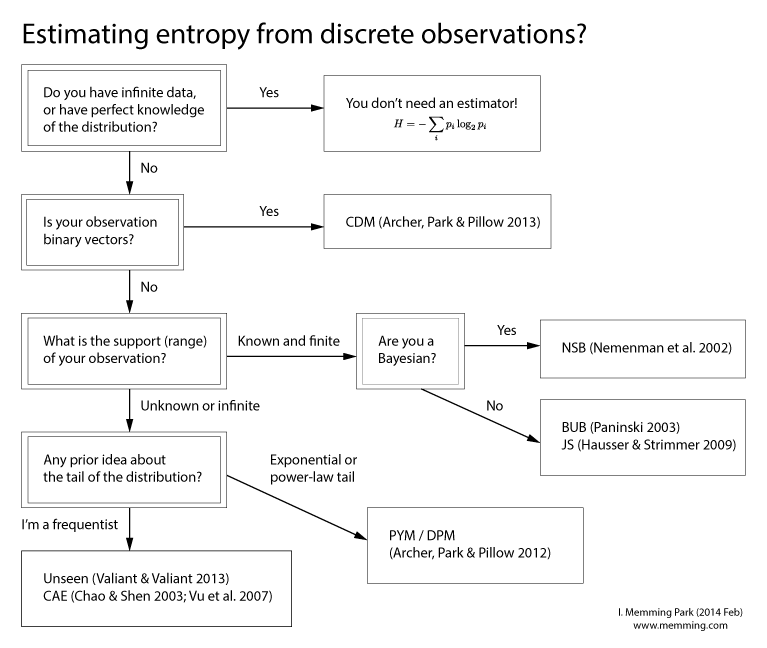 Those estimators provide posterior distributions or credible intervals as well as point estimates of entropy. Note that the assumptions made by these estimators do not have to be valid to make them good entropy estimators. In fact, even if they are in the wrong class, these estimators are consistent, and often give reasonable answers even in the undersampled regime. Nemenman-Shafee-Bialek (NSB) uses a mixture of Dirichlet prior to have an approximately uninformative implied prior on entropy. This reduces the bias of estimator significantly for the undersampled regime, because a priori, it could have any entropy. Centered Dirichlet mixture (CDM) is a Bayesian estimator with a special prior designed for binary observations. It comes in two flavors depending if your observation is close to independent (DBer) or the total number of 1’s is a good summary statistic (DSyn). Pitman-Yor mixture (PYM) and Dirichlet process mixture (DPM) are for infinite or unknown number of symbols. In many cases, natural data have a vast number of possible symbols, as in the case of species samples or language, and have power-law (or scale-free) distributions. Power-law tails can hide a lot of entropy in their tails, in which case PYM is recommended. If you expect an exponentially decaying tail probabilities when sorted, then DPM is appropriate. See my previous post for more. Best upper bound (BUB) estimator is a bias correction method which bounds the maximum error in entropy estimation. Coverage-adjusted estimator (CAE) uses the Good-Turing estimator for the “coverage” (1 – unobserved probability mass), and uses a Horvitz-Thompson estimator for entropy in combination. James-Stein (JS) estimator regularizes entropy by estimating a mixture of uniform distribution and the empirical histogram with the James-Stein shrinkage. The main advantage of JS is that it also produces an estimate of the distribution. Unseen estimator uses a Poissonization of fingerprint and linear programming to find the likely underlying fingerprint, and use the entropy as an estimate. Other notable estimators include (1) a bias correction method by Panzeri & Travis (1995) which has been popular for a long time, (2) Grassberger estimator, and (3) asymptotic expansion of NSB that only works in extremely undersampled regime and is inconsistent [Nemenman 2011]. These methods are faster than the others, if you need speed. There are many software packages available out there. Our estimators CDMentropy and PYMentropy are implemented for MATLAB with BSD license (by now you surely noticed that this is a shameless self-promotion!). For R, some of these estimators are implemented in a package called entropy (in CRAN; written by the authors of JS estimator). There’s also a python package called pyentropy. Targeting a more neuroscience specific audience, Spike Train Analysis Toolkit contains a few of estimators implemented in MATLAB/C. A. Antos and I. Kontoyiannis. Convergence properties of functional estimates for discrete distributions. Random Structures & Algorithms, 19(3-4):163–193, 2001. P. Grassberger. Estimating the information content of symbol sequences and efficient codes. Information Theory, IEEE Transactions on, 35(3):669–675, 1989. S. Panzeri and A. Treves. Analytical estimates of limited sampling biases in different information measures. Network: Computation in Neural Systems, 7:87–107, 1996. This year, NIPS (Neural Information Processing Systems) had a record registration of 1900+ (it has been growing over the years) with 25% acceptance rate. This year, most of the reviews and rebuttals are also available online. I was one of the many who were live tweeting via #NIPS2013 throughout the main meeting and workshops. Compared to previous years, it seemed like there were less machine learning in the invited/keynote talks. Also I noticed more industrial engagements (Zuckerberg from facebook was here (also this), and so was the amazon drone) as well as increasing interest in neuroscience. My subjective list of trendy topics of the meeting are low-dimension, deep learning (and drop out), graphical model, theoretical neuroscience, computational neuroscience, big data, online learning, one-shot learning, calcium imaging. Next year, NIPS will be at Montreal, Canada. I presented 3 papers in the main meeting (hence missed the first two days of poster session), and attended 2 workshops (High-Dimensional Statistical Inference in the Brain, Acquiring and analyzing the activity of large neural ensembles; Terry Sejnowski gave the first talk in both). Following are the talks/posters/papers that I found interesting as a computational neuroscientist / machine learning enthusiast. He described how theoretical quantities in reinforcement learning such as TD-error correlate with neuromodulators such as dopamine. Then he went on to Q (max) and SARSA (mean) learning rules. The third point of the talk was the difference between model-based vs model-free reinforcement learning. Model-based learning can use how the world (state) is organized and plan accordingly, while model-free learns values associated with each state. 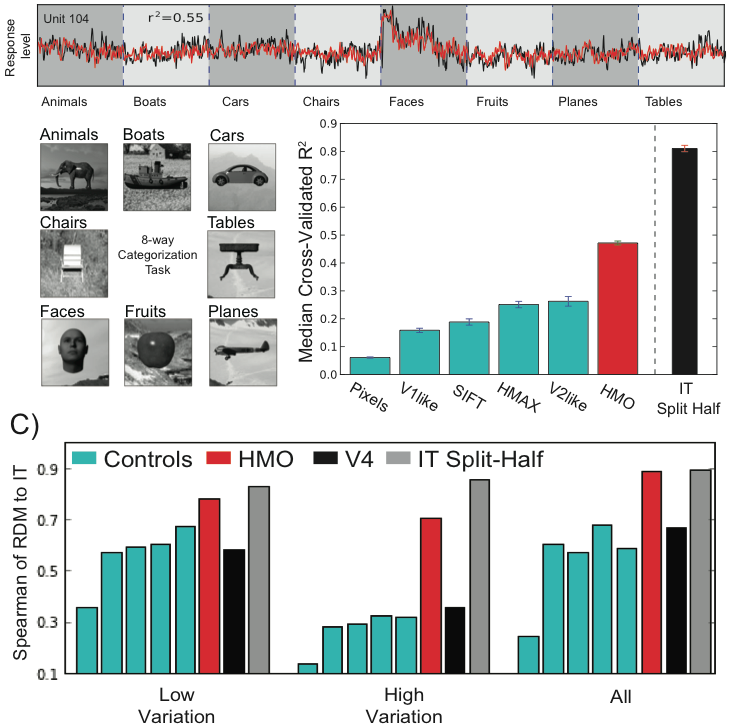 Human fMRI evidence shows an interesting mixture of model-based and model-free learning. Despite its molecular complexity, most systems level neural models describe it as a scalar valued strength. Biophysical evidence suggests discrete states within the synapse and discrete levels of synaptic strength, which is troublesome because memory will be quickly overwritten for discrete/binary-valued synapses. Surya talked about how to maximize memory capacity (measured as area under the SNR over time) with synapses with hidden states over all possible Markovian models. Using the first-passage time, they ordered states, and derived an upper bound. Area is bounded by where M and N denote number of internal states per synapse and synapses, respectively. Therefore, less synapses with more internal state is better for longer memory. Several recent studies showed low-dimensional state-space of trial-averaged population activities (e.g., Churchland et al. 2012, Mante et al 2013). Surya asks what would happen to the PCA analysis of neural trajectories if we record from 1 billion neurons? He defines the participation ratio as a measure of dimensionality, and through a series of clever upper bounds, estimates the dimensionality of neural state-space that would capture 95% of the variance given task complexity. In addition, assuming incoherence (mixed or complex tuning), neural measurements can be seen as random projections of the high-dimensional space; along with low-dimensional dynamics, the data recovers the correct true dimension. He claims that in the current task designs, the neural state-space is limited by task-complexity, and we would not see higher dimensions as we increase the number of simultaneously observed neurons. In a series of papers (Büsing et al. 2011, Pecevski et al. 2011, Habenschuss et al. 2013), Maass showed how noisy spiking neural networks can perform probabilistic inferences via sampling. From Boltzmann machines (maximum entropy models) to constraint satisfaction problems (e.g. Sudoku), noisy SNN’s can be designed to sample from the posterior, and converges exponentially fast from any initial state. This is done by irreversible MCMC sampling of the neurons, and it can be generalized to continuous time and state space. Using an animal model of schizophrenia using ketamine that shows similar decreased gamma-band activity in the prefrontal cortex, and decrease in PV+ inhibitory neurons, it is known that Aza and Zeb (DNA methylation inhibitors) prevents this effect of ketamine. Furthermore, in Lister 2013, they showed a special type of DNA methylation (mCH) in the brain grows over the lifespan, coincides with synaptogenesis, and regulates gene expressions. They extend previous year’s paper to high-dimensions. Our ability to infer functional connectivity among neurons is limited by data. Using current-injection, he investigated exactly how much data is required for detecting synapses of various strength under the generalized linear model (GLM). He showed interesting scaling plots both in terms of (square root of) firing rate and (inverse) amplitude of the post-synaptic current. They built a model that can predict (average) activity of V4 and IT neurons in response to objects. Current computer vision methods do not perform well under high variability induced by transformation, rotation, and etc, while IT neuron response seems to be quite invariant to them. By optimizing a collection of convolutional deep networks with different hyperparameter (structural parameter) regimes and combining them, they showed that they can predict the average IT (and V4) responds reasonably well. Instead of maximizing mutual information between the features and target variable for dimensionality reduction, they propose to minimize the dependence between the non-feature space and the joint of target variable and feature space. As a dependence measure, they use HSIC (Hilbert-Schmidt independence criterion: squared distance between joint and the product of marginals embedded in the Hilbert space). The optimization problem is non-convex, and to determine the dimension of the feature space, a series of hypothesis testing is necessary. Maneesh compared the underlying latent dynamical systems fit from synchronized state (drowsy/inattentive/urethane/ketamine/xylazine) and desyncrhonized state (awake/attentive/urethane+stimulus/fentany/medtomidine/midazolam). From the population response, he fit a 4 dimensional linear dynamical system, then transformed the dynamics matrix into a “true Schur form” such that 2 pairs of 2D dynamics could be visualized. He showed that the dynamics fit from either state were actually very similar. Eftychios have been developing various methods to infer spike trains from calcium image movies. He showed a compressive sensing framework for spiking activity can be inferred. A plausible implementation can use a digital micromirror device that can produce “random” binary patterns of pixels to project the activity. Noise correlations in the brain are small (0.01 range; e.g., Renart et al. 2010). Anesthetized animals have higher firing rate and higher noise correlation (0.06 range). He showed how latent variable model (GPFA) can be used to decompose the noise correlation into that of the latent and the rest. Using 3D acousto-optical deflectors (AOD), he is observing 500 neurons simultaneously. He (and Dimitri Yatsenko) used latent-variable graphical lasso to enforce a sparse inverse covariance matrix, and found that the estimate is more accurate and very different from raw noise correlation estimates. Using light-sheet microscopy, he imaged the calcium activity of 80,000 neurons simultaneously (~80% of all the neurons) at 1-2 Hz sampling frequency (Ahrens et al. 2013). From the big data while the fish was stimulated with visually, Jeremy Freeman and Misha analyzed the dynamics (with PCA) and orienting stimuli tuning, and make very cool 3D visualizations. Under certain observability conditions, they stitch together partially overlapping neural recordings to recover the joint covariance matrix. We read this paper earlier in UT Austin computational neuroscience journal club. They already showed that the number of clusters inferred from DP mixture model is inconsistent (at ICERM workshop 2012, and last year’s NIPS workshop). In this paper they show theoretical examples, one of which says: If the true distribution is a normal distribution, then the probability that # of components inferred by DPM (with ) is 1 goes to zero, as a function of # of samples. To detect a 3-way interaction which has a ‘V’-structure, they made a kernelized version of the Lancaster interaction measure. Unfortunately, Lancaster interaction measure is incorrect for 4+ variables, and the correct version becomes very complicated very quickly. This work brings both test power and computational speed (Gretton et al. 2012) to MMD by using a blocked estimator, making it more practical. Supervised dimensionality reduction technique. Connection between generalized eigenvalue problem and KL-divergence, generalization to beta-divergence to gain robustness to outlier in the data. This paper presents a meta-active-learning problem where active learning is used to find the best policy to teach a system (e.g., human). This is related to curriculum learning, where examples are fed to the machine learning algorithm in a specially designed order (e.g., easy to hard). This gave me ideas to enhance Eleksius! Reconciling priors” & “priors” without prejudice? This paper connects the Bayesian least squares (MMSE) estimation and MAP estimation under Gaussian likelihood. Their theorem shows that MMSE estimate with some prior is also a MAP estimate under some other prior (or equivalently, a regularized least squares).